In an effort to squeeze some extra performance out of my trusty Asus EeePC 900 I finally got around to upgrading the memory from the standard 1GB DDR2-400 to 2GB DDR2-667. 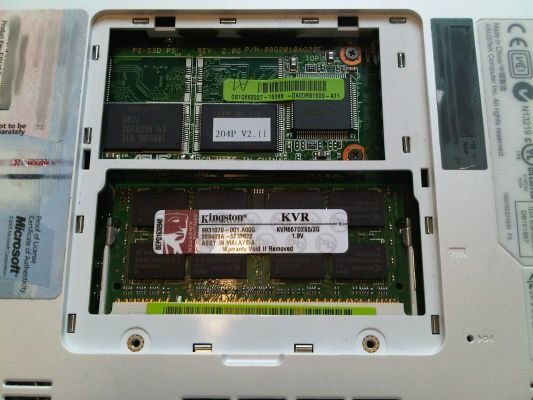 After several attempts of the poor thing not even booting with the new memory installed I was about to give up when I found an obscure forum posting that gave the solution so I thought I’d post it here too in case someone else has the same problem. The steps are easy! Release the two clips on the side and ease old memory out. Push in new memory, gently ease it down and it should click into place (don’t press too hard!). Replace battery, press power button and immediately press F2 until the BIOS screen comes up. That’s it! Your Eee should reboot with your usual OS. It was the whole BIOS step that had passed me by. Still too early to comment on any increased performance, but it definately works and hasn’t blown up yet. 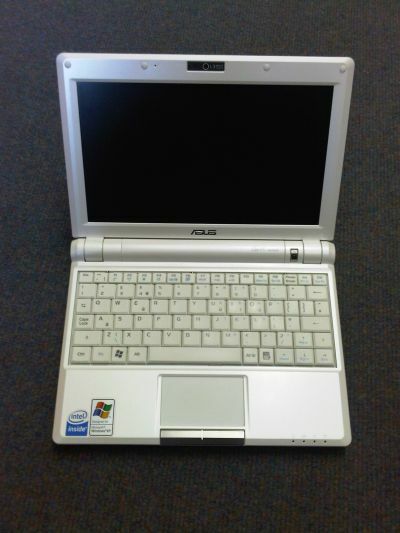 For the unitiated, the Eee PC 900 is one of the Eee PC range from ASUS, the beauty is just it’s size: it’s so portable with only an 8.9 inch screen and weighing just under 1 kg. For it’s size it’s not bad for performance either (although avoid the 16G version, it seems to be a downgrade). There are more recent versions out there, but this one has the advantage of a solid state hard drive so it will take knocks and bumbs quite happily. Mines running XP, with Office 2007 installed with no problems. It’s also fine for occasional Second Life use (good enough to get in world and do basic housekeeping) and also has the latest version of Matlab installed which it seems quite happy with. Having said that though, this little beauty should not be seem as a replacement for a laptop.. but for day to day stuff when you need to travel it’s fantastic. Another useful tip: I use the SD slot for a 8 gig SDHC card for my documents which can be shared amongst the other PCs/Laptops I work on. Now of course these cards are easy to slip out and steal, so for security I use TrueCrypt.. it sets up a virtual drive on the card which needs a password to access. Keep frequent backups and if you lose the card, it doesn’t matter. And yet another useful tip: The primary SSD fills up fast. There are files you can safely delete to clear up room that Windows stores, and you can force programs to install on the secondary SSD by default.. the latter is achieved by a utility called “AutoC2D” which can be downloaded from the official Asus site (www.asus.com).